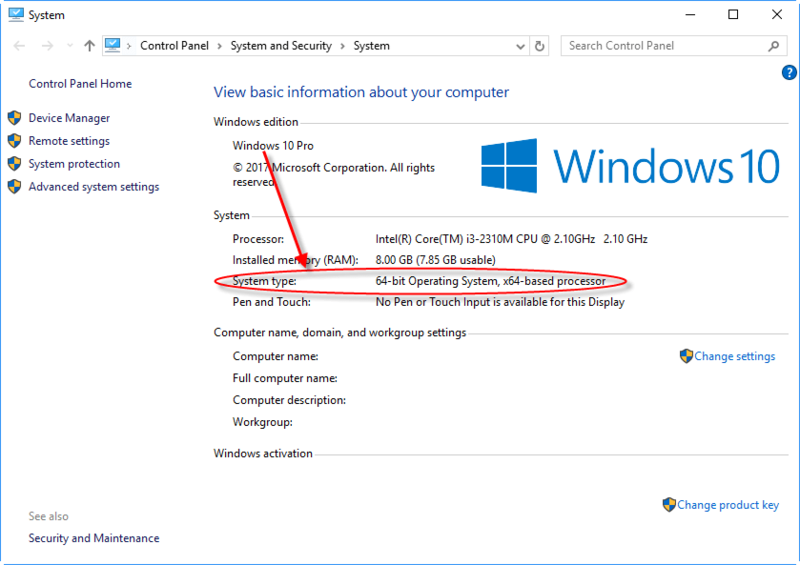 When we need to install a driver or software onto your computer, it is very confusing “is my Windows 32 bit or 64 bit?” This tutorial will explain how you can tell if you are running a 32 bit / 64 bit Windows. What is 32 bit / 64 bit? These two terms are frequently used in the computer industry. Actually, it is the hardware architecture of the PC how a processor handles the information. In 32 bit maximum 3 GB of ram can be handled, But 64 bit architecture can handle more than that. Actually, it depends on the architecture of the operating system which is installed on our pc. Like for 32 bit windows, you need a 32 bit windows driver or software. How to determine, is Windows 32 bit or 64 bit? It is easy to find out the bit architecture of the installed windows. Follow the below instruction to find out which computer structure are you using: 32 bit or 64 bit. The different version of windows can have different steps. Please select your windows version. Step2: After clicking on properties you’ll get a window which has listed all the system info, go to “system type” and check it’s value there. It would be either 32 bit or 64 bit, so it the your system type. Watch Video Tutorial – How to check my computer is 32bit OS or 64bit in Windows 7? Step2: After clicking on the system you’ll get a window which has listed all the system info, go to “system type” and check it’s value there. It would be either 32 bit or 64 bit. So it is your system type of your operating system. Watch Video Tutorial – How to check my computer is 32bit or 64bit in Windows 10, 8.1? Now you know which Windows bit is installed on your PC. Download the same bit of the printer driver for your Windows. Answer: The steps are same for Windows 10 Pro as well. You can follow the same steps. 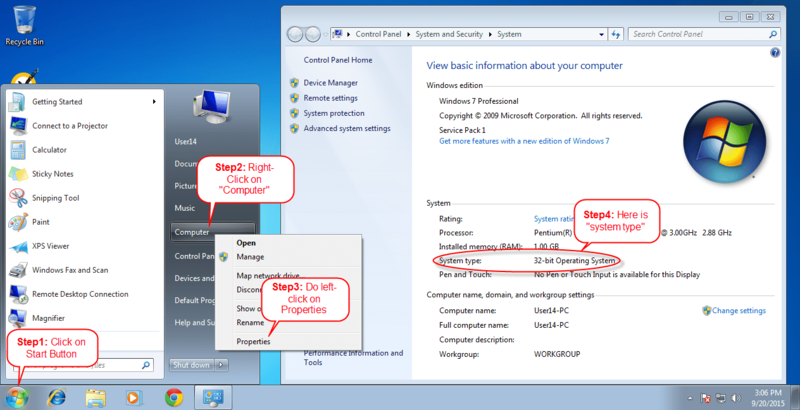 Answer: Windows 7 steps are already listed above. You need to check the "System type" field to get your system bits information. The Windows 7 video is pending yet (Jan 24, 2019). We'll add the video very soon. Question: Can I install to windows 98. Answer: Yes, the steps are same for Windows 98 as well. You can check the OS version by right-click on "my computer" and then click on "properties". How to know the operating system of my computer? my windows is xp version2002 service pack 2,so is it 32bit or 64 bit choice?? Please share your problem in this comment section, we’ll help you. My window is windowXP version 2002 pack 3 ..so is it bit 32 or bit 64? If you see “x64 Edition” listed under system, it means you’re running 64bit version of xp. If you don’t see “x64 Edition” listed under System, it means you’re running the 32-bit version of Windows XP. Here is the link to download HP deskjet 1000 printer drivers. I have a HP Deskjet 1000 J110 series. I used it a couple of times. then yesterday when i was about to print, it says ready but don’t have the green check mark on it. So when i click the “print” button, it doesn’t work. It keeps on pending my files. I have the printer’s cd here, and it says it’s not compatible because of the operating system. I used it a couple of times, so how come it ended up like this? Im using windows 8.1 Single Language with Bing. Green check mark on printer is a sign of default printer. So you just need to right-click on the HP 1000 printer and do click on “default printer.” If this trick doesn’t work then try to turn of your printer and computer once and disconnect and connect the printer’s USB cable once and then start your computer. Contact us again if doesn’t fix after all that. I’ve tried your suggestions. The good thing about the green check mark, it worked. so i tried to print but still don’t work. I also tried to turn off my computer and disconnected them. But still don’t work. It keeps pending my files . It says “printing” but doesn’t print. Do uninstall and then re-install the drivers completely and let me know if doesn’t work. it says “not compatible” with the laptop im using. it has to be windows 7. how come its NOT compatible? I’ve used this printer several times with the same laptop. Please let us know the model number of your printer and your computer’s operating system. Windows 8.1 single language with Bing. I need Driver HP Laserjet 1018 for Windows 8. Can someone help me? Sure, we’ll provide you the drivers for windows 8. Drivers for Windows 7 32bit of HP 1018 printer are avaialble on this page: http://www.freeprinterdriverdownload.org/hp-laserjet-1018-driver-download/. Could you please provide us the model number of the printer for you want windows 8.1 drivers so that we can help you. Sure, please let us know what is the problem are facing while installing printer wirelessly. Simply download its full featured driver package and run that and then choose wireless connection to install printer. Make your printer is ON at that time and wireless button is also switched on. How to install Epson L360 printer? It is showing canceled error. We suggest you to install the printer driver using “Run as administrator” mode by right-clicking on the setup file. Please come back if this trick doesn’t work for you. If this trick did not work for you, then we are sharing with you an article, please follow the article’s steps.